There are few artists in our collection that are as accomplished in as many forms of entertainment as Angna Enters. Born Anita Enters in New York City in 1907, Enters wore many hats including artist, dancer, mime, and writing. Her art career intertwined with that of her performance career as she attended the Art Students League of New York in 1919 while simultaneously working on dancing. Enters was awarded a Guggenheim Fellowship in 1934 to study Hellenistic art in Athens, Greece. Much of the body of her artistic work is tied with her dancing and mime career as well as her art historical studies. She exhibited regularly displaying sketches of costume and set designs and archaeological-like studies. 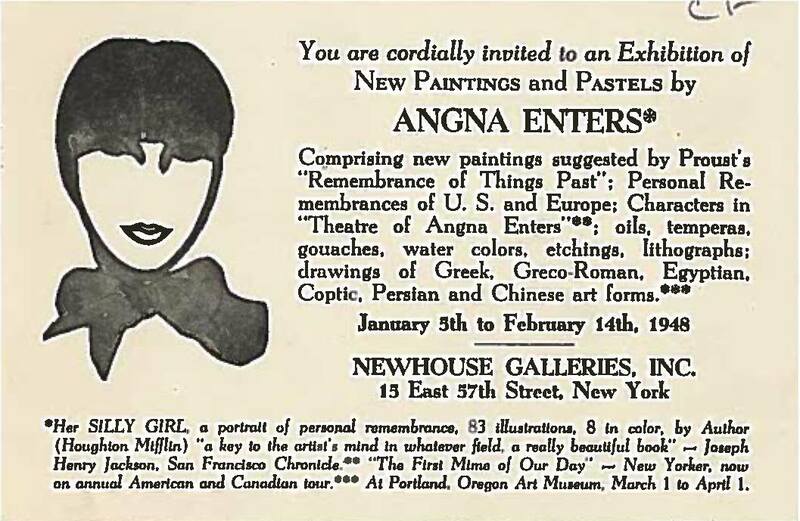 Our files had many of the exhibition invitations to her art shows that promised images of a broad array of topics (political caricatures, sailboats, bull fights for example) from many different cultures (Chinese, Persian, Greek, Roman, etc.) all while simultaneously promoting her own performances and recently published books. That’s a lot to fit on one small postcard! We were happy to find that the Corcoran files provided us with some of the exhibition invitation cards that we did not have. 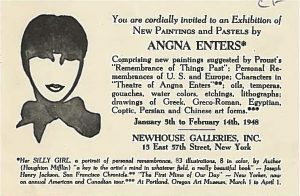 The Smithsonian has many items of and about Angna Enters throughout the institution including the Archives of American Art, the Smithsonian American Art Museum, and the National Portrait Gallery. 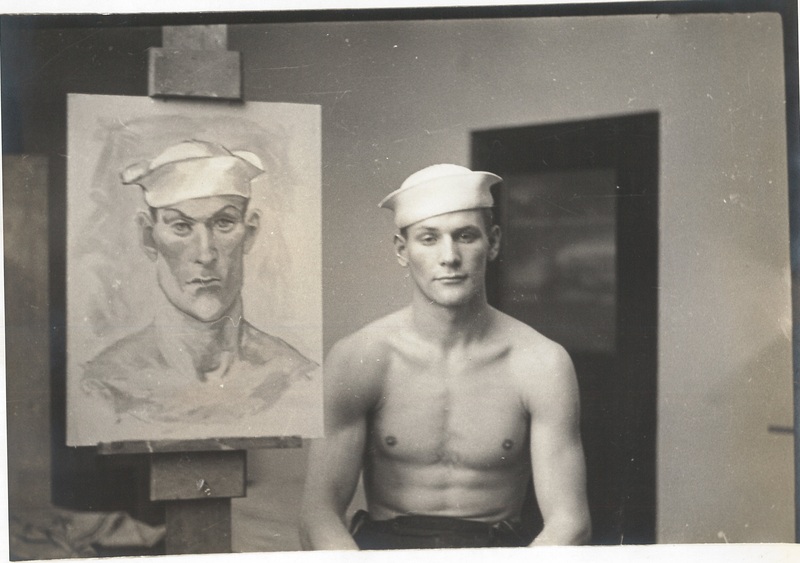 Another great addition to our collection from the Corcoran donation is a photo of a model posing with a portrait of himself painted by artist Emlen Etting. Etting was born in Philadelphia in 1905 but spent quite a bit of his early life in Europe. After graduating from Harvard where he studied French, Etting began a serious pursuit of an art career by studying art in Europe, ultimately settling in Paris. Photo of a model sitting next to a portrait of himself painted by Emlen Ettings. Date, title unknown., and photographer unknown. Just like Angna Enters, Etting was also creatively gifted in many areas. He is known primarily for his paintings and sculptures but he was also known, for a time, as a filmmaker. This particular skill was useful during World War II in which Etting served in the psychological warfare division of the Office of War Information. Etting was first stationed in London and worked as a French announcer and writer for the American Broadcasting Station in Europe. He traveled with soldiers through France continuing his broadcasts as well as distributing information to the French people about the efforts of the United States and the status of the War and eventually broadcasting the liberation of Paris. His experiences and conversations with the people of wartime France were documented through art and books he would produce after the War. After the War, Etting returned to the United States to continue his art career mainly as an illustrator. He experimented and used many different styles, both figurative and abstract. He created many portraits as well as landscapes and still lifes. Etting produced many images of sailors including this portrait shown in the photo from the Corcoran donation which may have been a study for another finished piece. There is no information about the photo such as a photo studio, date, or name of the model. However, it is possible that the image was provided by Midtown Galleries as they distributed other images of his works at the time. Images of the artist at work with the model are always helpful in the research of the artist’s technique and career. For more research on Etting, you can contact the Archives of American Art to see his papers on mircofilm.